This card was fairly straightforward to make with a piece of backing paper, a floral die cut from Tonic and a stamped verse using a Chocolate Baroque stamp.The butterfly was cut out twice and layered - gilding wax added to accentuate the embossed detail. Love the way that floral die-cut works against the blue patterned paper & your inking of the sentiment echoes the butterfly's pearly body gorgeously. 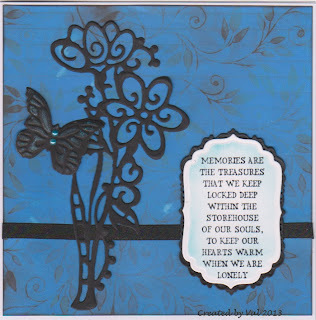 A beautiful card Val, and such a lovely sentiment too.